Last week we had a cold and rainy day so I made this new soup for the first time. It was the easiest and yummiest soup I have made! Amelia liked it, Anna sort of liked it, and Brian and I really liked it. I found the recipe here and swapped out the shrimp for diced turkey sausage. •In a soup pot, slowly melt cream cheese and butter over low heat. •Add green onions and simmer 10 to 15 minutes. •Stir in potato soup and corn. Simmer 10 to 15 minutes. •Stir in milk to desired consistency. Begin with 1/2 cup of milk and add more if needed. Soup will be thick. •Add cooked sausage and heat thoroughly. O.K.... I'm not sure what happened to Sneezy & Bashful but does this Ewok and R2D2 really think Snow White won't notice? I mean come on... Bashful is the designated driver and this pink sparkle limo isn't going to drive itself! Photo credit goes to my hubby, we love how the kids set up their toys. Ahhhh, you can see the desk and I can breath again! So much better than this! I found this great tutorial and had to make this cute skirt for the girls. I changed mine up a bit: I only added the ruffles to the front of the skirt and I sewed the elastic right to the fabric instead of encasing it. I thought it would be less bulky around the waist this way. I also added two skinny strips of fabric to the top row so that you won't see the sewing stitch and it makes an extra ruffle. Since I made my skirts out of 2 old white t-shirts I dyed it on the stove. I knew white skirts on a 4 & 5 year old would not be white for long! I dyed each skirt one at a time and learned that the first item will be a bit darker so if you want the items to match you should dye them in a bigger pot at the same time. I need to get a bigger pot! Anyway... it was easy to make and pretty cute for about $1.50 a skirt (elastic & dye). I'll add a photo with the girls wearing them soon, but it is cold and rain today. This is what I walk into when entering the bathroom after the girl's bath night... barbie butts. After bath time Brian collects the toys into a basket, but because the barbies have long wet hair Brian sets them on the side of the tub to dry. But it's the way he lines them up that is a bit funny looking. Poor Brian, the only man in the house. He is holding up well... he has the girls hooked on watching Batman cartoons with him and they also love Star Wars toys and Speed Racer. Another peek at my home... the fridge is usually cluttered with Amelia and Anna's cute art work. I don't really like this mess of stuff on the fridge but I can't resist any art work the girls make, they are so proud of it. After something has been up for awhile I either put it in the save folder in the office or I hide it in the recycle bin. But... I have been caught several times and they ask... Mama why is my picture in the trash? I usually play stupid and say it must of fell in there by accident. Then I hang it back up until I get another chance at the recycle bin. Well... I just can't keep it all, especially the amount they both create each day! But it is cute stuff! Check out my second stop motion video staring my handmade plushy friends: Anna, Sweet Tooth and Baby Sweet Tooth. I have 4 videos, check them all out. Believe it or not there is a nice big desk under all this junk! Ugh... I really need to clean my office before I end up on the hoarders show! O.k. I'm not that bad but I do need to clean this desk off, it's very hard to work in clutter! I am not usually like this but ever since I had kids it's hard to keep the house picked up. They just go from room to room making one mess after another. And my poor office has become the dumping ground. It doesn't help that I use this room to work, craft, sew, scrap book, pay bills, file, sort mail and much much more. O.k. it's getting cleaned up and I give myself untill Monday.... go, go, go! So after our failed attempt to grow pumpkins last summer we are still hopeful to produce something from the garden this year. We planted seeds and already have little sprouts growing! We are going to try to grow zucchini, beans, and have some flowers starting. I have also been gathering info about growing tomatoes and cucumbers upside down in hanging containers. So we'll give it a try and see how it goes... I'll keep you posted. I made this card for Brian, it is hand cut with green and red paper applied to the back. It's a grasshopper playing "Fly me to the Moon" on his violin. Brian and I are hooked on this new show called American Pickers (on the History Channel). These two guys search for the rusty goodies most people would walk way around. They clean it up a bit and make a profit. Brian and I have always loved to antique shop and before kids would spend hours in the antique malls or auctions treasure hunting. That's how we ended up with our waterfall bedroom set and an old wooden wheelchair. The wheelchair was resold a few years ago to make room for kid stuff. But our love for the hunt and deal is still strong. Heck, Brian proposed to me in an antique mall... that's another story, but it should tell you we are "Pickers" by heart and this show is right up our alley! 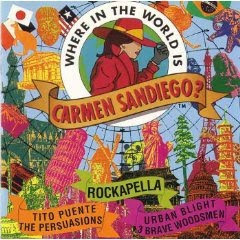 The song "My Home" is on the CD "Where in the world is Carmen Sandiego". This is one of my all time favorite songs. Brian wanted to play it for our last dance at our wedding. I had never heard it before but as I listened to the words I knew why he wanted it. This is one of those songs that when I hear it playing it transports me back to the dance floor with Brian holding me in his arms and then ending with an Irish jig dance from his sister. Go take a listen. And I know I'll never be walking alone. This is in my dining room... 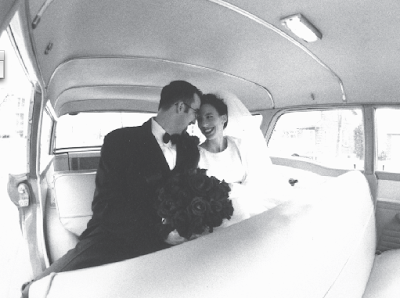 I am remembering 10 years ago, our wedding day. I remember at the church before our wedding I sent my maid of honor to give Brian a small gift, the two penguins with a note. Then years later I found the two matching baby penguins and saved those for him as gifts when Amelia and Anna came along. I love to recycle and I have a say I have been bringing bags to the store before it was cool to bring bags. At that time I sewed my own bags because then you couldn't buy them. I remember getting annoyed looks from the baggers, I know it's a bit harder, my bags didn't come with a stand to keep them open. I am so happy with the progress of reusable bags, did you know that some stores give you money if you bring your own bag? Target gives you 5¢ back and Whole foods gives you money or you can donate the money to their charity. It's just good all around! When shopping I still used the plastic bags in the produce dept. and when I saw someone who made these tulle produce baggies, I thought wonderful... why didn't I think of this? I had some tulle from some gift wrapping that I had saved and made these super easy baggies. So... if you have a sewing machine get crackin'. If not, your not off the hook because there are several great etsy shops that make these bags, no excuse! Need to buy bags? Check here or here or here. Thanks for being GREEN with me! The girls and I made these cake balls for Brian to celebrate our 10th anniversary. I found this recipe for cake pops and just made them with out the sticks. The turned out so good that they are now Brian's favorite homemade treat! I like that they are pretty easy to make, look fancy and taste yummy! Once firm, insert a stick into the cake ball and dip it into the candy coating by holding the stick and rotating until covered. Once covered remove and softly tap and rotate until the excess candy falls off. Don’t tap too hard or the cake ball will fall off, too. After 3 months in the front yard we finally torn down the milk jug igloo (click here if you never saw it complete). At first Anna stood in front of it in protest, she did not want to tear it down, she loved playing in it. But then we told her she could have the first hit with the baseball bat and she agreed. I worked hard on building that igloo but it was really a wonderful feeling to hit it as hard as I could with a baseball bat! Then stomping all the milk jugs flat was a great stress reliever! We filled our recycle bin and 3 other neighbor's bins with the jugs. One neighbor asked if we will build another igloo next year, I laughed and said no way... but who knows... maybe we'll build something else! We picked up the girl scout cookies last week, our troop sold over 1,600 boxes and it filled up one van and one small suv (my car was completely filled with Thin Mints). Then we took them to our cookie mom Christy's house and filled her living room with cookies. You can't see them all here, but her living room was full! We took Amelia's boxes home and we sorted them all out. She made herself a sign with an arrow attached to it saying... Don't forget me, is Amelia. She sold 136 girl scout cookies. She is a star! As you can see she is learning to write and is spelling phonetically. Our troop made over $900 which is great since we were down to $50, so this money will really help! My 10 years married to Brian have been wonderful and I would do it all over again! I am so very lucky to have my best friend by my side everyday.